It’s always a challenge to be tasteful when featuring sponsors in content and what not. But one area where it is almost too natural to see sponsors is professional sports. Just look at all the millions spent in endorsements on celebrity athletes. Michael Jordan and Nike, Paul Rodriguez and err… Nike. Matthias Dandois with Vans and Redbull. The list goes on. 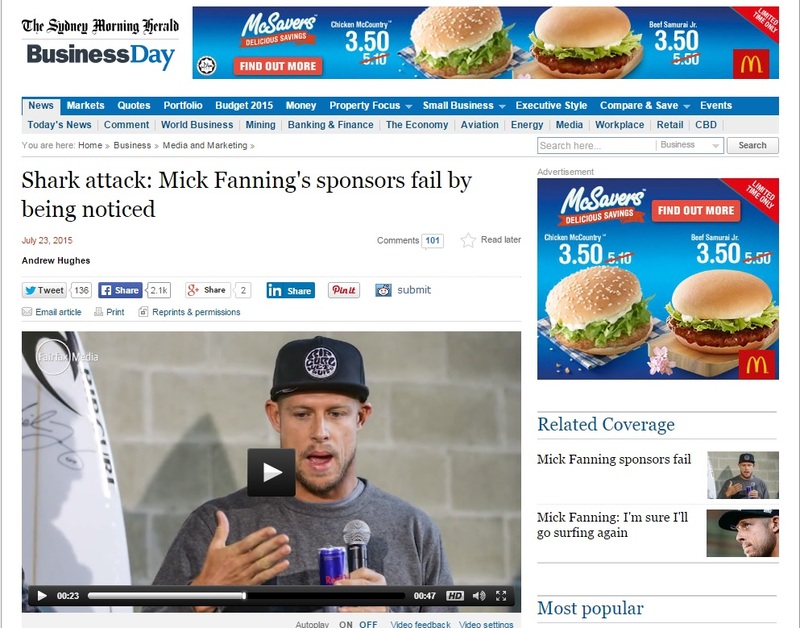 But then there is the press conference that Mick Fanning did with Julian Wilson. As you would probably remember (or not… considering the fact that last week’s hot news can be forgotten instantly), Fanning is the surfer that was attacked by a shark while competing at Jeffrey’s Bay, South Africa. He dramatically escaped on live TV by punching the shark in the back and also, thanks to his competitor, Wilson, who came to his rescue along with the safety marshals. The press conference, which was an opportunity for the press to hear the story from Fanning and Wilson themselves, was just too decked out with all his sponsors (he and Wilson were actually drinking cans of Red Bull while speaking to reporters) that it got widespread condemnation. Many thought it was distasteful of all these corporations to take advantage of a situation like Fanning’s close call with a shark. Sponsorship and product placement runs on the basis of being associated with an image that is positive for the corporations. For example, if Canon would like to be associated with a cool documentary filmmaker like Zan Azlee, they would sponsor him and then let it be an influence in the long run. Being too blatant would be defeating the purpose. Go read more about this at The Sydney Morning Herald (and view the video of the press conference as well). ← The Fat Bidin Podcast (Ep 57) – Shut up media, you’re asking too much!